Look-out!!! Someone in China is going to take over our sector online! At least I think that is the response this email is expecting. So my company name is allegedly being registered in China and all of the trademarks etc. are in danger dot dot dot. I have an email here from jim.wang@asiaregistration.net who assures me I need to act fast! We received an application from Huadu Ltd on July 18, 2017. They want to register " insolvencyit " as their Internet Keyword and " insolvencyit .cn "、" insolvencyit .com.cn " 、" insolvencyit .net.cn "、" insolvencyit .org.cn " 、" insolvencyit .asia " domain names, they are in China and Asia domain names. But after checking it, we find " insolvencyit " conflicts with your company. 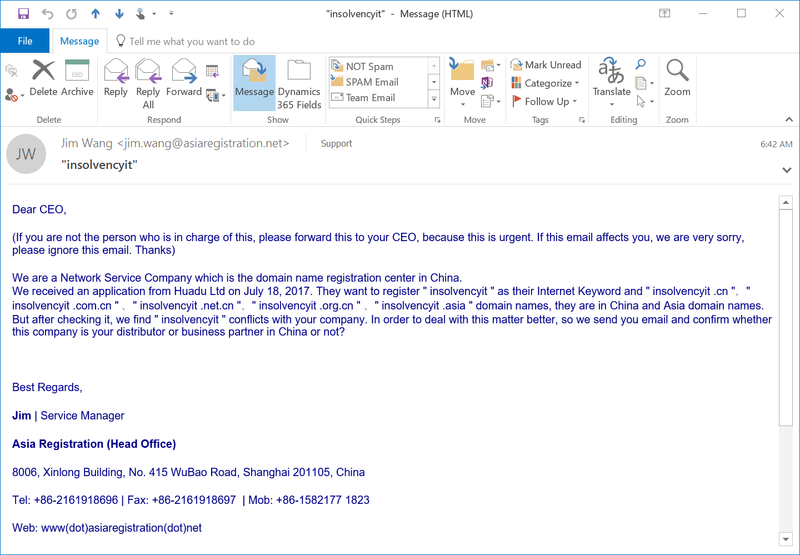 In order to deal with this matter better, so we send you email and confirm whether this company is your distributor or business partner in China or not? No registration of any domain will affect a company in any other country - there are so many national domain suffixes and other suffixes that registering them all would be a serious drain on your company profits for no reason. Asia Registration (Head Office)I have removed the phone numbers etc. for the purposes of this email. Web: www(dot)asiaregistration(dot)net This is important as they are trying to stop their email pointing to www.asiaregistration.net in order to disassociate themselves for some reason - this would indicate wrongdoing of some kind and suggests this email is spam and should be ignored. Do not ever register domains you do not need - they are a waste of time and should not be bought defensively - unless you are an online retailer and want to prevent a specific competitor buying a certain keyword domain. Stick to your single website and invest in that and the quality of your work will be concentrated in one place to get you a good ranking. Everything else is hearsay and happenstance. This kind of scam is old story. I use to receive this kind of email and they also send me mail to my home too. There are so many scams like this from China. Howdy! I 'm myself browsing your blog from my new iphone! Just wanted to say I love reading through your blog and it look forward to your post.